This story and photo original published in the Miami Herald October 16, 2018. Miami Dolphins players Kenny Stills, Ja’Wuan James and Kenyan Drake all consider themselves foodies. As football players, after all, they eat a lot, sometimes as many as five-to-six meals a day. But even they were blown away Tuesday afternoon when they walked into Blue Collar Miami, a small restaurant in the MiMo district of Miami, and enjoyed a three-course lunch put together with with the help of Taste of Immokalee, a student-led enterprise in rural Southwest Florida where high school students learn business skills while also making use of the produce of the area. The meal on Tuesday, prepared by Blue Collar Miami chef and owner Daniel Serfer, centered around Immokalee produce and featured various salsas and sauces the group sells. Profits go back to their community — which has a poverty level above 40 percent — and toward scholarships for students as they prepare for college. Their products are available online and at Publix. About two dozen people feasted on a meal that included a chips and salsa appetizer, a chilled tomato gazpacho soup, spare ribs with a smokey barbecue sauce and french fries, and corn ice cream topped with blueberries. Serfer said the idea for the luncheon came about in April or May. About six months later, it came to fruition. 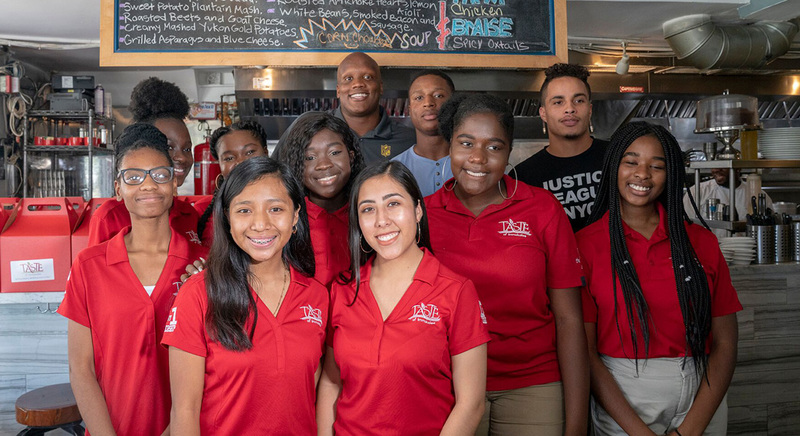 The 10 or so students from Taste of Immokalee who made the nearly two-hour trip to Miami set everything up on the front end and helped with meal prep. Reid Carpenter, the president of Taste of Immolakee, said the group has helped about 100 students since its founding in 2014. The kids do the majority of the work. The adult presence is primarily for guidance. The Dolphins players, who are regularly involved in the community year-round, were certainly inspired. They took time in between courses to talk to the kids about their life ambitions, how the group has evolved and offer support and encouragement throughout the afternoon.